‘Three, no four…’ or ‘Two, no three…’ is a Hebrew literary form for making lists. The last item in the list is usually the main point. You can find other examples of this form in Proverbs 30:15-16, 21-31. I have noticed a trend among our young Bohemian or hipster artists to make lists to communicate or to reflect. The next three, no four posts will each feature one thing that I find wonderful. The first has a background in Lebanon in the wake of the recent depredations of the Islamic State in Iraq. Let me give an oversimplified overview of recent Lebanese history. Of course this land was once the haunt of the ancient sea-faring Phoenicians. The French had colonies in the area even prior to World War I, but with the break-up of the Ottoman Empire in W.W. I, the Empire’s lands on the East Mediterranean Coast were divided into British and French mandates (the infamous Picoe-Sykes Agreement). The French Mandate in Lebanon achieved Independence on November 28, 1941, with the last French troops withdrawing in 1946. The government in the early years was dominated by the Marionite Catholic Christians. Several other large populations included Shi’ite Muslim Arabs, Sunni Muslim Arabs, Druze, Orthodox Christian Arabs and others. In the post-World War II years, Lebanon was usually a peaceful and prosperous country. International financial and commercial institutions were based there. High-end tourism was a major industry. Lebanon was frequently called the Switzerland (diverse peoples living together democratically, prosperously and peacefully) of the Middle East. But then after the 1967 Arab-Israeli War, Palestinian refugees began to flood Lebanon. By 1968, Yasser Arafat’s Palestine Liberation Organization (PLO) was attacking Israel from South Lebanon. You can see what will happen next, can’t you? Of course Israel responded and the various sects were drawn into ever shifting alliances as Lebanon began to slide down into conflict and fragmentation. The Civil War lasted from 1975 to 1990. Parts of Lebanon were occupied by the Syrians, and sporadically by the Israelis, from 1992 to February 2005. A 2006 incursion of Israel into South Lebanon to stop rocket attacks and cross-border hostage-taking and murders, has led some Lebanese to value the Iran-sponsored terrorist organization, Hezbollah, as a counter-weight to Israel. Now, the wonderful thing. The major television network, Lebanon Broadcasting Corporation (LBC), responded in an imaginative way to the confiscation of Christian homes and then the driving out of Christians from Mosul, Iraq by the savages, Islamic State (ISIS or ISIL). The savages, of course, beheaded people, buried men, women and children alive and sold some women into sexual slavery. And then painted the Arabic letter for N, pronounced ‘noon’, on Christian buildings to be confiscated. The letter looks a bit like an ‘u’ with a dot over it, and exactly like my current avatar. The N stands for Nasrani (“Nazarenes”), a pejorative for ‘Christians’. This must remind us of the Nazis placing yellow stars on Jews. Many people around the world began to say ‘WeAreN’ in solidarity. Back to LBC. Management changed their logo (which you can see above) to include a ‘noon’ and they gave t-shirts to their broadcasters with the letter ‘noon’ on them, somewhat gutsy moves considering the above history. 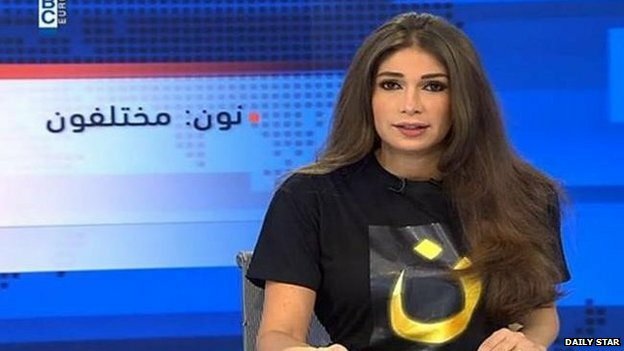 At the height of the terror in Mosul, the lovely Shi’ite news anchor Dima Sadek came on the air wearing the ‘noon’ t-shirt and began to speak with these words: “From Mosul to Beirut, we are all Christians.” Wonderful! Perfect! Classy! Cool! This post was powered by the albums, “The Late Greats – 2014 Summer Mix” (2014) and “More Miserable Than You’ll Ever Be (Deluxe)” (2014), both by the 77s. Tags: Beirut, Dima Sadek, LBC, Lebanon, Mosul, solidary, The 77s | Permalink. The essential focus of the church, it seems, has never really left the Middle East. Such courageous souls! Lord bless and protect all the believers in Lebanon and Iraq, and Pakistan, or wherever they may reside or take refuge. And praise LBC! Not sure I’m ready to moniker a “noon.” I kind of think the Jews in Nazi Germany should have refused to wear the Mogen David too. In light of the results, I would have expected the German Jews to pull out a pistol and promptly shoot their antagonists right in the forehead. Ultimately I think the results would have been better for them. However, I do admire those who have adopted the symbol for the sake of solidarity. But I’m not sure if it would be considered “baiting” if the wearer happened to shoot an antagonist in the forehead. Does being a pacifist go along with the symbol? Hmmmmm.